“Texas Independence Day Celebration”—presented by H-E-B—is an annual two-day living history celebration from 10 a.m. to 5 p.m. on Saturday and Sunday, March 3 and 4, 2018 on the 293-acre Washington on the Brazos State Historic Site to commemorate when 59 delegates bravely met in 1836 to make a formal declaration of independence from Mexico. On March 2, 1836, 59 men met in Washington, TX to declare Texas’ independence from Mexico. Celebrate this occasion by returning to the very spot the declaration was signed for a free two-day living history experience, featuring live demonstrations, entertainment, food, crafts, games and more. The admission-free event features two stages of non-stop live music, food, crafts, Texas A&M University Singing Cadets, the Kids History Zone, Mount Rose Missionary Baptist Church Choir, Aggieland Mariachi Band, “The Birth of a Republic” historical play about the signers of the declaration, Brenham Children’s Chorus and other commemorative programs. Admission fees are waived for the site’s attractions (Independence Hall; Star of the Republic Museum and Barrington Living History Farm) for that weekend celebration. Admission to the grounds, on-site shuttles and parking are also free. Historical reenactors set up a bonafide 1836 Texas Army camp on the park grounds, where visitors can wander freely to learn how the soldiers and their families lived then, including musket and cannon firings. The new museum exhibit in the Star of Republic Museum titled “So Others Could Follow: Four Centuries of Maps That Define Texas” will open that weekend and will illustrate the evolution of Texas over four centuries, both topographically and politically. 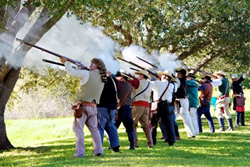 “Texas Independence Day Celebration” is presented by H-E-B and coordinated by the Washington on the Brazos State Park Association with the assistance of Texas Parks & Wildlife Dept., Blinn College and The Texas Army reenactors. Washington on the Brazos State Historic Site is halfway between Houston and Austin at 23400 Park Road 12, Washington, TX, 77880—off of State Hwy. 105. From Hwy. 105, follow either FM 912 or FM 1155 to Park Road 12. Contact: 936-878-2214 or jon.failor(At)tpwd.texas.gov. More information and updates on the TIDC schedule can be found at http://www.wheretexasbecametexas.org and http://www.facebook.com/washingtononthebrazos/. Washington on the Brazos State Historic Site—a TPWD-run state park--has many onsite amenities open daily, as well as an incredible schedule of events and programs. On-site attractions include Independence Hall; the Star of the Republic Museum of Blinn College and Barrington Living History Farm. The site’s Visitor Center features interactive exhibits which present a timeline of the Texas Revolution and houses the spacious Washington Emporium Gift Shop. Entrance to the park grounds, Visitor Center and parking is always free. The Fanthorp Inn State Historic Site is an authentically preserved example of a 19th century stagecoach inn, located in Anderson, TX. This expansive park on the Brazos River provides a beautiful setting for picnicking, sightseeing, bird watching and four geocaching sites—two each from TPWD and the Brenham/Washington County Chamber. A Conference Center for meetings, weddings and reunions and the Education Center with two classroom-style spaces can be rented. An outdoor amphitheater and two open-air pavilions are also available for rent. Washington on the Brazos State Park Association memberships for individuals, families and businesses include free admission to the site’s attractions for a year, and—for some levels—private parties during the park’s special celebrations. Washington on the Brazos is located on the Brazos River at the original townsite of Washington, Texas. Located at 23400 Park Road 12, Washington, TX, 77880—approximately halfway between Brenham and Navasota, off of State Hwy. 105. From Hwy. 105, follow either FM 912 or FM 1155 to Park Road 12. Contact office(at)wheretexasbecametexas.org or (936) 878-2214 for more information; updates on all WOB festivities, including TIDC, are continually posted at http://www.wheretexasbecametexas.org. Hotels that will provide discount pricing for TIDC weekend include Holiday Inn Express & Suites, 2685 Schulte Blvd., Brenham, TX 77833, 979-830-5331; Best Western Inn of Brenham, 1503 Hwy. 290 E., Brenham, TX 77833, 979-251-7791; and Best Western Navasota, 8965 Hwy. 6, Navasota, TX 77868, 936-870-4100.